I probably would not have read this book if not for the fact that I went to Sarajevo last year. As it turns out, the guidebook I had recommended this book for further reading, as the plot revolves quite a bit in Sarajevo. Sarajevo is a beguiling city, in my opinion, and as much as it has been a casualty of war, the city holds quite a bit of heritage and other priceless treasures, that I truly enjoyed my stay when I was there. And while I was there, I had the opportunity to view the Sarajevo Haggadah in the National Museum of Bosnia and Herzegovina. Perhaps due to curiosity, as well as a special fondness I have with respect to the city, that I decided to get my hands on this novel and read it. This novel is historical fiction. The history of the Sarajevo Haggadah is quite opaque: scholars know that it originated in Spain, and because it included illuminations, this was atypical, as Jews typically do not like illustrations and illuminations (unlike Christianity, for example). The Haggadah is a prayer book, and includes several scenes taken from the Jewish belief system. The novel takes the puzzles from history, and somehow fictionalizes the remaining questions, providing plausible scenes about what the book went through as it was found in various locations in Europe. As such, I couldn't help but compare it to The Red Violin, which was a Canadian film about a violin and its journey around the world from Cremona to Montreal. Somehow, one thing I didn't like about People of the Book was that there wasn't continuity between the locations. It would have been nice of the author to provide plausible explanations on how the book traveled from Seville to Tarragona to Venice to Vienna to Sarajevo. Instead, what we have are snapshots of the lives of the people surrounding the book while the book was in these various locations. The reader is left to his own imaginative devices to figure out how the book moved. While I have nothing against using my imagination, I didn't like it nevertheless, after all, this was the whole point of reading a novel, because if I were to use my imagination, I might as well have imagined the whole book myself. 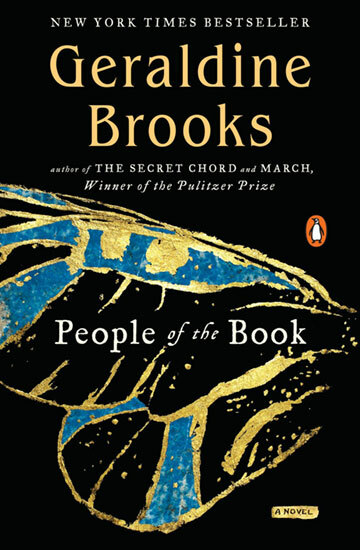 It would have been nice if Brooks provided a plausible account of the migration as well. Another thing I didn't like was the overly dramatic story of Hanna Heath, in the present time. It was in my opinion overly sentimental, and overall distracting to the whole focus of the novel, which was supposed to be the Sarajevo Haggadah. A few pages into the book, there's already a love scene. And this whole angle of friction between her and her mother just didn't fit well with the serious and historical tone of the book. As such, it felt like I was reading a book that was mostly historical fiction, yet interspersed with material from an airport novel. I did like the historical aspect of this novel, and I must say, I loved the fact that the book was well-researched. The descriptions of Sarajevo was quite accurate, from the narrow streets of Baščaršija to the wide boulevard in front of the National Museum. Reading these pages brought me back to when I was there. If anything, I liked reading this novel because it provided me more depth and background to my visit to the city last year. Overall, I have a few things in this book I do not like, but overall it still is a good read. Try to read it if you're into historical fiction. Just try to ignore the sappy parts. I give it 4 out of 5 stars.